Hip dysplasia (HD) is a pathology borne by the COXO-femoral joint that affects many dog breeds and may have often severe arthrosic evolution. It was the first skeletal and hereditary pathology studied in the dog. 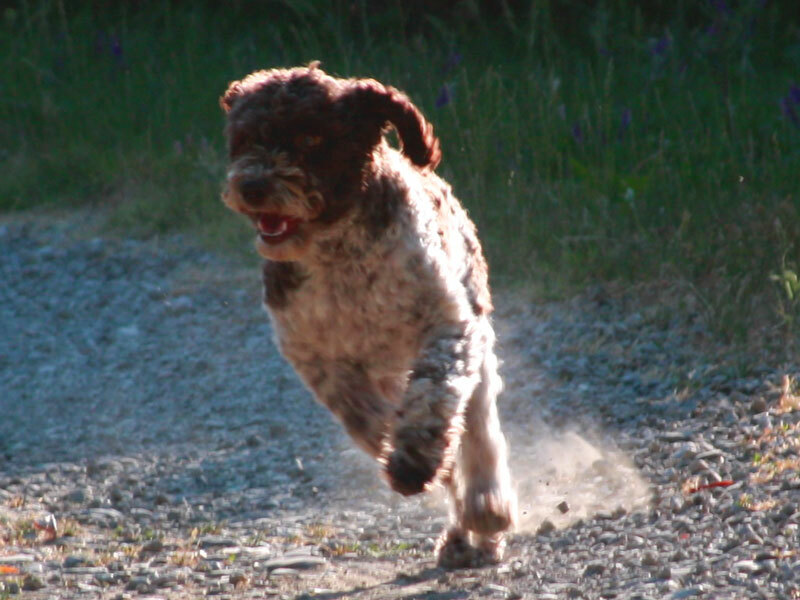 The Lagotto Romagnolo passes for being a breed that is not afflicted by dysplasia. The reality is very different! Its light weight well supports light grades of dysplasia. And this is a very positive fact. The difference between withstanding dysplasia well to be free of dysplasia is so much, even too much! For those who breed, dysplasia puts important stakes. It represents costs, it discards some easy couplings, it forces to remove some dogs from the reproduction. It means dealing with problems and situations. In some cases even vets do not help. Where there is money there is always someone ready to take advantage. In all categories. And even dysplasia for someone can only be a business. For those who buy a puppy Lagotto is often “not knowing” that pushes to buy puppies without controls. Just looking at the price can lead to wrong choices. Even worse to pay puppies as selected because the Lagotto Romagnolo passes for being a breed not afflicted by dysplasia. 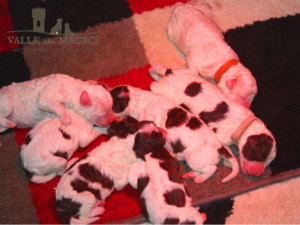 Our choice is to have litters exclusively from Lagotto Romagnolo whose degree of dysplasia is ascertained by official radiography on hips and elbows. Only with this information we can determine the right pairings, think of healthy puppies and pursue the improvement of the breed. Enci does not limit the degree of dysplasia within which the reproducers must stand. The limit is on the recognition of selected reproducers. Only Lagotto Romagnolo with a degree of hip dysplasia A, B, C are recognized as selected breeders. The breed clubs, all, each for the related breed, have self-limiting. The Italian Club Lagotto Romagnolo admits only dogs with hip dysplasia degree A, B, C to the list of male breeding males. For the dysplasia of the elbows the Club does not set limits. It is ETHICAL to proceed with the reproduction and breeding of the Lagotto Romagnolo with X-rays of dogs whose degree of dysplasia is ascertained OFFICIALMALLY. These are the reading stations that establish the degree of dysplasia and report it on the pedigree. They issue official certificates such as those reported in all the cards of our Lagotti Romagnoli. All of them! No one can give guarantees of exemption from dysplasia for puppies. Since polygenic diplasia is a disease, there is no genetic test for it. In order to claim that the genetic heritage of parents is free from dysplasia, they must not be dysplastic, all siblings, grandparents and uncles. 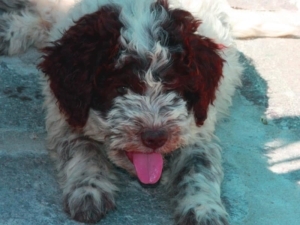 The genetic patrimony of the Lagotto Romagnolo is not so vast. Pedigree and X-ray dogs also serve this purpose, to qualify the relationship to go in the right direction. Dogs with dysplasia degree C can give birth to puppies with dysplasia degree A and vice versa. It also depends on the kinship. It makes no sense to ignore this pathology for those who breed or even for those who buy a puppy of Lagotto Romagnolo. Welcoming a puppy of Lagotto Romagnolo son of parents and in case tested grandparents, shifts the odds of having a healthy puppy heavily on our side. The F.C.I. Fédération Cynologique Internationale classifies elbow dysplasia in 5 degrees.